Richard Trench worked for the Observer, the Guardian and the Financial Times on a freelance basis, and wrote the Time Out Guide to Paris for five years. 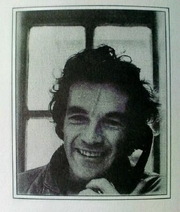 He is the author of Forbidden Sands (1972), an account of his crossing of the Sahara to the salt mines of Taoudenni, and Arabian Travellers (1986). He co-wrote London Under London (1985) with Ellis Hillman. Richard Trench is currently considered a "single author." If one or more works are by a distinct, homonymous authors, go ahead and split the author. Richard Trench is composed of 1 name.